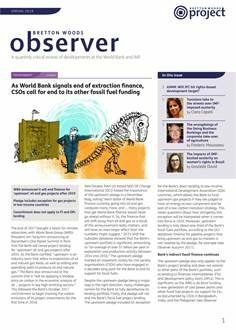 Following the release in November 2017 of the World Bank’s Draft Guidance Notes for Borrowers (GNs, see Observer Winter 2017-2018) that will support the implementation of its much-criticised Environmental and Social Framework (ESF), civil society organisations (CSOs) expressed concerns about the content of the GNs and the consultation process generally. In a December 2017 letter to the Bank, 29 CSOs called for the draft GNs to be “substantially revised” in light of their “redundancy, lack of clarity, and lack of substantive content”, and for the Bank to hold a second comment period. The Bank has compiled CSO input into the draft GNs, which it stated will be aggregated into a detailed ‘response matrix’ explaining how and why comments were or were not incorporated into the revised GNs. The matrix will be made public within three months of the closure of the comment period on 22 December 2018. The Bank maintains that, as the GNs are living documents that don’t require Board approval, no additional consultation is needed. Civil society on the other hand continues to consider the GNs a flawed tool that provides little help to borrowers on the implemention of the new ESF. Given the Bank’s own admission of the importance of GNs in supporting borrowers to effectively implement the ESF, CSOs maintain that the Bank should not roll out the ESF until the GNs are revised and fit for purpose.